Bablovia, the plane on which Unstable takes place, is a very strange and wacky place, and that zaniness shines through every card in the set. Action: This is an art variant card with four versions. In each version we see the same kid striking the same enthusiastic, heroic pose on a stage. What changes on each version is his costuming and the scenery around him; each represents a particular plane from Magic's history. We're looking for something evocative of an elementary school play: "low budget" costuming, cardboard cutouts colored in with crayon—as messy and low-quality as they can be, but still be recognizable as the particular plane. 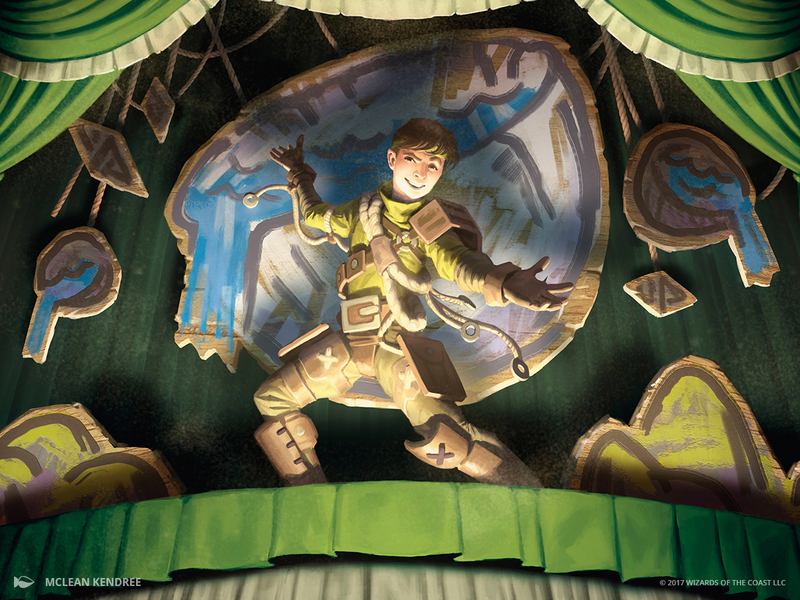 In this version, the stage and his costuming are dressed as Zendikar, with a big cardboard version of the iconic "bowl island" hanging behind him. Mood: Look at me! I'm from Zendikar! 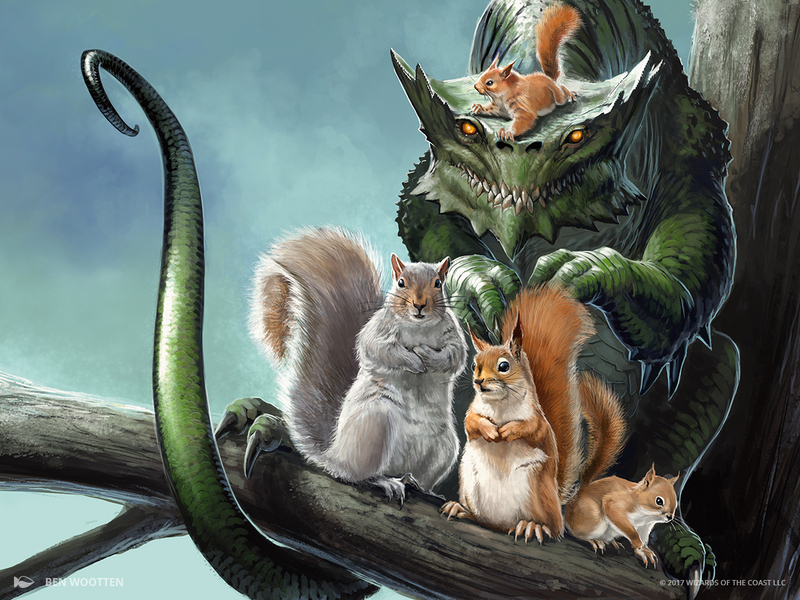 Action: Show us a family of ordinary Squirrels—two adults and two or three babies—who have an additional "adopted" family member: a large lizard-like monster with huge teeth, perhaps resembling the reference. The adopted family member is positioned with the baby Squirrels and hunched down to fit in the photo, but is much bigger than the adult Squirrels. Mood: one of these things is not like the other . . .
Action: This art is a silly riff on an existing piece of art. The scene is much as before, but now a Goblin is guzzling from the bottle, with glowing blue liquid spilling down his chin. The symbol is bigger and swirlier, threatening to overwhelm the whole scene. A large electric fan sits in or near the opening on the left, blowing wisps of the blue smoke away out the opening. Notes: The important thing here is that this be 1) recognizably a riff on Cryptic Command, and 2) silly and fun. 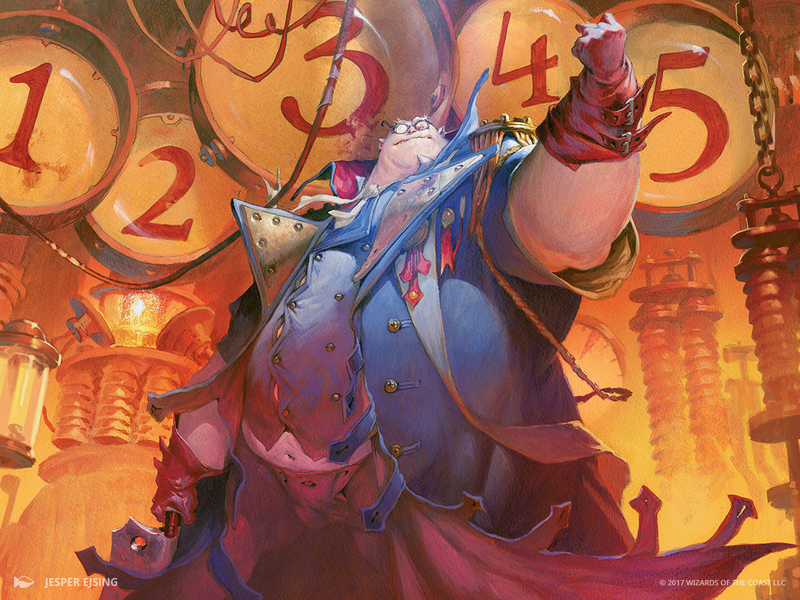 Wayne England created the artwork for the original Cryptic Command printed in Lorwyn, and later an alternate version of the art for a promo card. When it was known that Very Cryptic Command would be in Unstable, we only had one artist in mind. 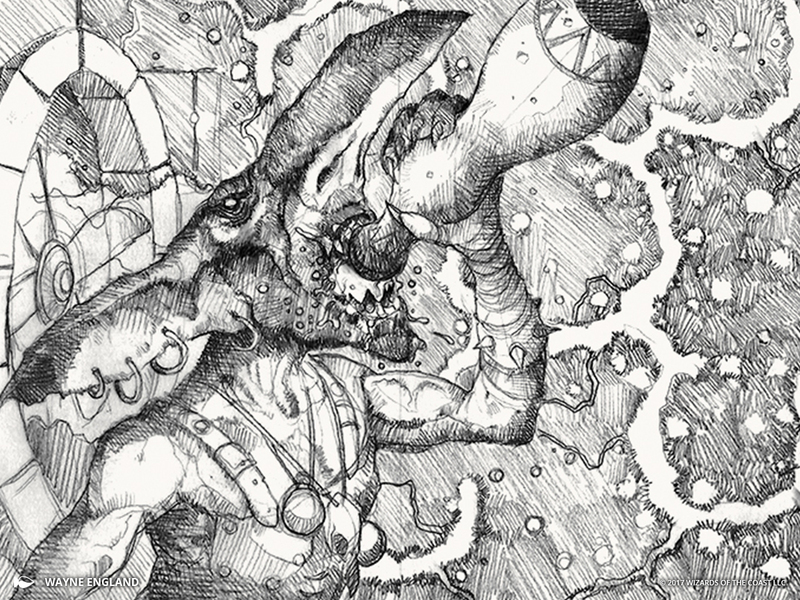 As a long-time Magic artist and fan favorite, Wayne was the obvious choice to riff on his own artwork a second time. Sadly, Wayne passed away before he was able to complete the artwork. As he was an icon in the industry, his passing sent a shockwave throughout the gaming community. Very Cryptic Command is the last piece Wayne created for Magic. We felt it was fitting to respectfully print the artwork as is—the sketch—as a tribute to honor Wayne, his art and legacy, and his fans. 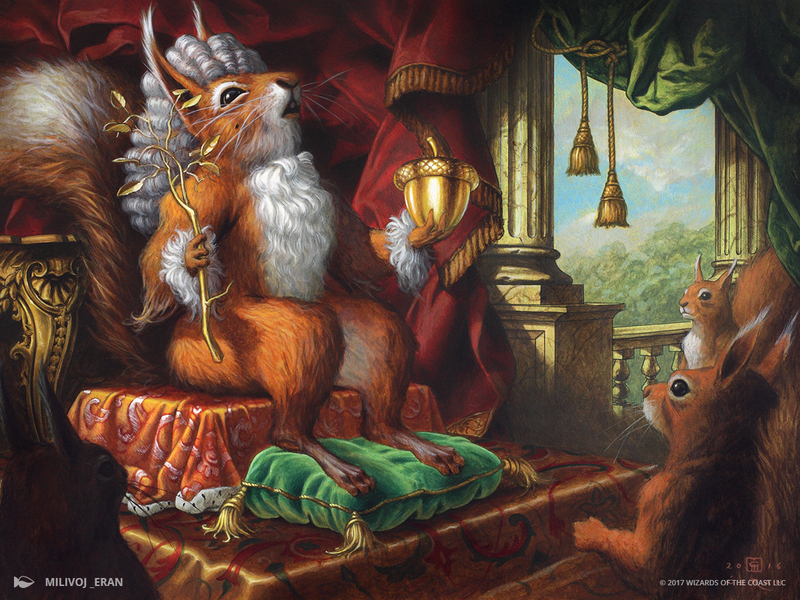 Action: Show us a regal, Baroque-style portrait of a very fancy and dignified Squirrel. The actual fur of the squirrel echoes some of the costuming cues of that era, such as a cravat or neck ruff, or a curling wig. In one hand it holds a large acorn, and a large twig or flower stalk in the other to evoke the scepter and "globus cruciger" of European kings. Intention: The piece is intended to mock the grandeur of old Baroque portraits, and the silliness of their costuming . . . though in Squirrel form. Overemphasis of these aspects is encouraged. Action: Introduce us to the legendary character Baron Von Count, using the dapper fellow in the reference as a starting point. He stands in his lair, arms spread wide, reveling in his moment of triumph. IMPORTANT: In addition to the character, this card's art must prominently incorporate the numbers 1 through 5. (The card's mechanics require counters to be put on the numbers.) They need to be clear, but they should also be incorporated into the setting as elegantly as possible. The numbers could be in a row at the top or bottom or arranged in a circle around the character, but they should be in order, and they need to be big enough to physically put a counter on at card size. Mood: Only an intellect that matches my own can truly appreciate the brilliance of my master plan! You see . . .